If you have previously provided a Sigma Tau Delta journal submission or applied for a Sigma Tau Delta/Penguin internship you already have an account. You may also have an account if your email address was used to register for a previous Sigma Tau Delta convention. 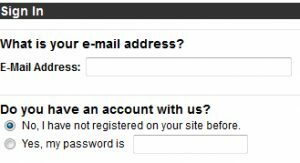 To access your account use the same email address and password you used for prior submissions. If information in your account has changed, please email englishconvention@niu.edu and include your name as listed in your account with the information that you wish to change. If you do not have an online account, you must first set up your account. Create a password containing at least five characters. All confirmations and follow-up communication will be sent to the email address associated with your account. Your account is now set up. Proceed with your submission from this screen. Direct any additional questions to englishconvention@niu.edu.